Today Which? Magazine (U.K.) published a comparative review of three major coffee chains in Britain: Starbucks, Caffé Nero, and Costa Coffee: Coffee shops | Overview. Their survey examined coffee prices, beverage quality, and how much their drinks are calorie bombs. For their taste test, they sent in an “undercover expert” — Whittard coffee buyer and taster Giles Hilton — to representative outlets in central London. (IMO, I’m a big fan of Whittard teas, which I have sampled and purchased at their London and Singapore locations, but I cannot comment on their coffee prowess — they honestly never struck me as a place to get good coffee.) Mr. Hilton sampled two coffee beverages at each shop — an americano and a cappuccino — and rated them for appearance, temperature, taste, and overall satisfaction. So while I might question his pedigree, it sounds like he at least had standard criteria. Starbucks came up the worst among his tests — too much water in the americano, and rather anemic milk frothing on the cappuccino. And to prove that you don’t always get what you pay for, Starbucks also rated the most expensive of the lot. Meanwhile, Caffé Nero scored highest for taste — and the cheapest (surprising, given that they apparently used twice as much coffee as the others in some drinks). U.S.-based Starbucks did win the calorie bomb contest, however. Their white chocolate mocha with whipped cream and whole milk weighed in at 628 calories — more than a quarter of the average person’s recommended daily calorie intake: BBC NEWS | Health | Morning coffee is ‘meal in a cup’. Face it: when it comes to girth and excess, America just can’t be beat. 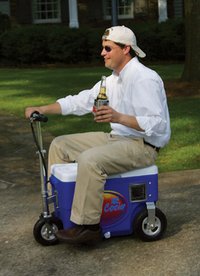 Just look at one of these items that surfaced at the recent Consumer Electronics Show (CES) in Las Vegas this month: the Cruzin Cooler, a motorized, rideable cooler — with cup holder — that can apparently motor a 300-lb person at speeds up to 14 mph. Who said, “you should never eat more than you can carry”? My latest idea for a gluttony-themed Italian-American restaurant concept, Troppo di Tutto (“Too Much of Everything”), might have legs afterall. Just no neck. No surprises there. Some people eat Starbucks for breakfast and lunch… In my city (Kansas City, MO), I’d say that SB is still considered “the” coffee destination. Outside our arts district, most of the locals haven’t discovered that coffee can be much, much better.